In our ninth analytics class, we focused on data visualization, which is used to visually depict a project’s results or analytics. Seeing a visual representation of data helps people to understand its meaning. It also makes the information more memorable as it helps to tell a story. Data visualization is particularly effective for conveying a project’s ongoing results, particularly KPIs, to stakeholders and showing them where they need to pay attention or course correct. There is a huge variety of data visualization formats you can use to tell the visual story of data — from conventional bar and line graphs to golden ratio depleting charts and intricate infographics. Fortunately, there are a range of tools available for creating them. We took some time to experiment with Tableau. I think this is a really versatile tool but it comes with a steep learning curve. I think it would be really useful for showing KPIs for my senior project, such as conversion rates from various social and organic referrals, possibly in a pie chart, to show which are most effective. I might also use a bar graphic to compare the time users spent on each of the niche social media network’s pages. However, in the interim, I wanted to try this tool on existing data. Last summer, I managed a youth shelter’s eight week fundraising campaign that was heavily promoted on social media. I used a tool called ‘SumAll’ to track Twitter results for this campaign and exported them into an excel sheet. I imported this into Tableau and experimented with the tool. One challenge was getting the weeks to display from oldest to latest. I re-labelled the weeks from a ‘week of Mon 08 Sept’ format to ‘week 8 (08 Sept)’ format in Excel to make the sequencing clearer. Latterly, I also found that in some views, you can click on the Dimension value to reverse the order. There is much more formatting I need to do but, the above bar graphic is a start at showing the stats from this campaign. 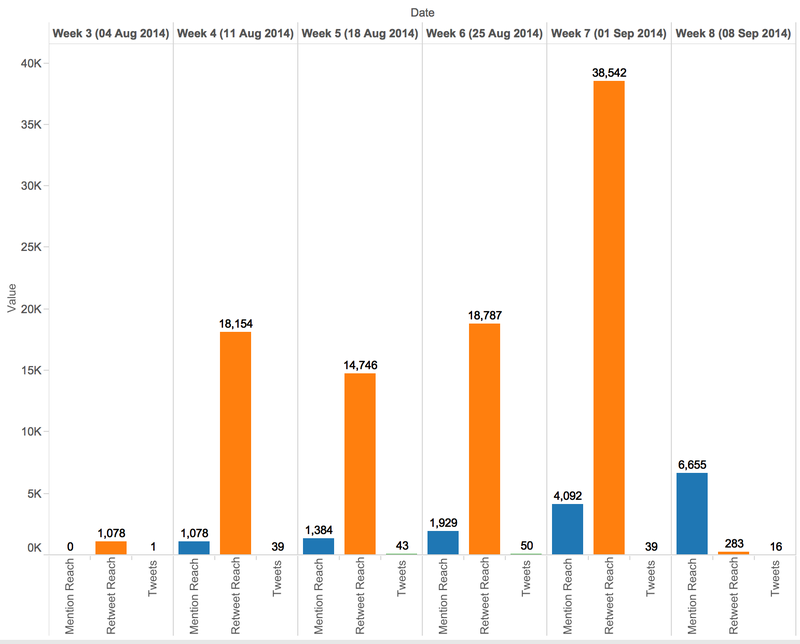 In this example, I used a side-by-side bar chart format to show the growing momentum of three measures (tweets, mentions reach and retweets reach) over the last six weeks of the campaign leading up to a September 6 event date. I filtered out the first two weeks, as the Mentions and Retweet reaches were minimal during this early part of the campaign. A graph like this could be used to demonstrate to a stakeholder the value of a campaign of several weeks, versus expecting comparable results with a one or two week period (which some might think adequate). I need to learn much more — but can’t even begin to visually imagine the data I must absorb to proficiently use these tools.